The June 2011 Newsletter has been posted: Links to photo galleries and additional information mentioned in articles in this newsletter can also be found there, too. The next SNU rally will be Thursday June 23 to Sunday June 26, 2011 at Sweetwater Summit off of Hwy 338 out of Wellington, NV. This is Field Day for all amateur radio operators. For those who are not hams, a weekend at Sweetwater offers great hiking possibilities and time to relax and enjoy beautiful vistas. 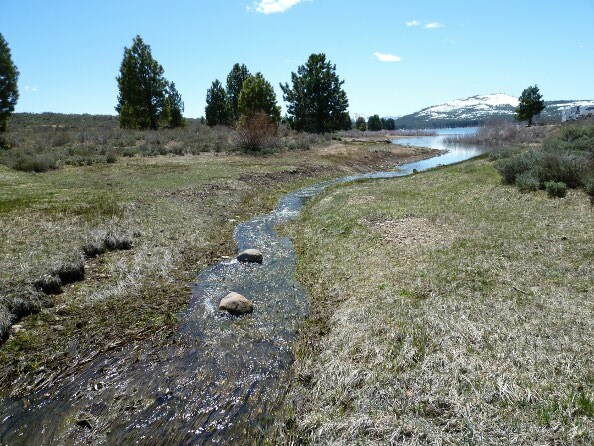 Sweetwater is a dispersed site with lots of room for everyone. So plan on joining us for our June rally in a great location. Get the details on the September SNU Anniversary rally. Don’t miss out. RSVP today! See the schedule for 2011. Miami – Visited Ernst for a little while – stopped raining. Stayed in Demming over the night. Arrived 7pm left at 10:19am. Raining. Side trip to Ray (a section here I can’t figure out) Rain, visibility poor. (a section here I can’t figure out). With rainy weather we were going to get back to Superior. Made it OK but would not like to take a trailer into Ray’s again. Trip over from Superior to Miami, rain and fog. Could only see about 20ft. Lots of water running over Airstream. Trip through Globe might need a detour. Approximately 4 miles or more of very rough and muddy road. Good trip back all the way to Demming. Mesillia Park. Arrived 12:00 rain and some sun. Visited Florence and Bill. Had a good Mexican lunch. Left about 2:30 for Rancho Grande Trailer Park. Made connection with the Caravan. Leave for Juarez Saturday Jan 12, 1957. Did a little shopping in El Paso. Bought Dad a couple pairs of Kahki pants and a few groceries then went back to see Florence and for supper, they took us to La Posta and had a good Mexican supper. I did a little washing before supper and fixed the hems on a pair of pants for Dad. Florence insisted we send the night with them and loaned us a couple pairs of Bills P.J.’s. Fort Sage is a BLM special recreation management area. It has a trail head and trails but no race circuit or training facility. That didn’t matter to some of the folks who were here from Chico and determined to help create a bad image for OHV enthusiasts. The pre-teens with the micro-vehicles went round and round the campground road. When adults nearby were asked about the required safety certificate, insults were the response. The claim was that it was public land and they could do anything they pleased — an approach that burdens us all with yet more rules and restrictions not to mention the unpleasantness in sharing a campground with folks who aren’t too concerned about other campers or the campground in general. But, for the SNU, it was entertainment and a topic for discussion. At least, it was during breaks in the activity. Spring was trying to get going and there were flowers blooming. The weather made for good cloud watching. When the campground emptied Sunday, Randy and Vicki could get out on the trails without risking their lives and enjoy much of what else is in the Fort Sage area besides OHV riding. I think a lot of these diary entries were written by Jo Harrison. Some of the handwriting was a little hard to read. Oh Gizmo! says Rand McNally Unveils Their TripMaker RVND Navigation Device Designed Specifically For RV Enthusiasts. the RVND 5510 will actually take into consideration the type, size and length of the RV you’re driving and will direct you to routes that are safe for travel with a large vehicle, even so far as to prioritize right-hand turns. The RVND is also considerably larger than your standard GPS device, including a bigger screen (480×272 resolution), larger on-screen buttons and a speaker with a bit more kick. This is an example of the personal navigation device evolution. Maps are becoming more and more current and up to date. Route planning is beginning to take into account vehicle capabilities and driver preferences. The stand alone devices like this are on one side and the online routing, such as Road Trip Planner at Weather Underground, providing current weather and traffic data are on the other. The missing pieces still provide a bit of frustration, though. The winter and early spring have been extreme across the West, with record snowpacks bringing joy to skiers and urban water managers but severe flood risks to northern Utah, Wyoming and Montana. And despite all the wet weather in the Rockies and Sierra Nevada, parts of eastern Colorado, New Mexico and Arizona are in severe drought and gearing up for what is forecast as a bad fire season. This is a part of what the climatologists call the ENSO, which is an ocean temperature pattern in the Pacific near the equator that cycles every few years between warm and cold. In recent years, its impact on global weather patterns has become better defined. There isn’t just one tool – yet – so you’ll need a collection to help plan your travels this spring. A PND, especially one with an RV focus can help while on the road. Online road trip planners can help you accommodate expected conditions in the next few days. Weather and climate reports can help you avoid floods and other such problems. Travel safe. One of the traditional indicators of spring is when Tioga pass finally clears for traffic. It looks as if it will be a bit late this year. The San Francisco Chronicle reports that not only is the pass opening going to be a bit late, the Half Dome climbers will also have to wait. Another issue is the spring run-off. The Arizona Daily Star says the Colorado River runoff picture stays good. It’s about 120% of average this year. In the Sierras it is more than 150%, which is why Tioga pass will take a while to clear. Meanwhile, in Reno the pear and crabapple bloom is in full swing but the Peavine snowcap says tomato growers need to wait a while, yet. The May 2011 Newsletter has been posted. Links to photo galleries and additional information mentioned in articles in this newsletter can also be found there. 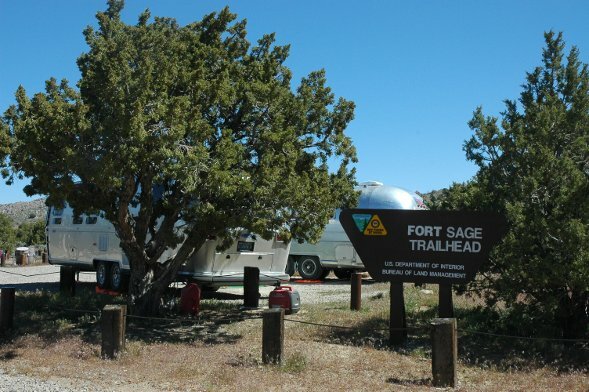 Thursday May 19 to Sunday May 22, 2011 the SNU rally will be at Ft Sage near Doyle, CA. Be sure and take the Laver Crossing exit about 2 miles north of Doyle. The other route often chosen by GPS has a narrow bridge which is not suitable for towing an Airstream. As has been the pattern this winter: an SNU event and a shortwave cold front. So getting there was a bit of a fight with the wind getting to the rally, the furnaces got a bit of a workout, the fishermen did more fishing that catching, and the scenery, company, and the afternoon weather were top notch. The picture is of the stream next to the campground as it heads to the lake. Its source is Boca Spring where there is another campground just a couple of miles up the hill.